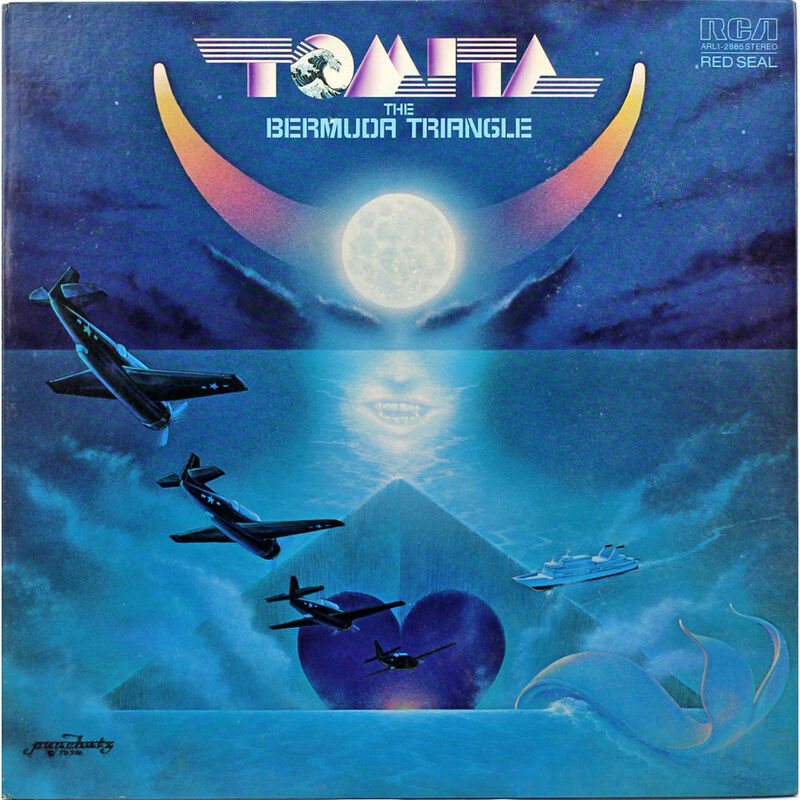 The Bermuda Triangle became a fixture in the popular imagination following the 1974 publication of Charles Berlitz’s The Bermuda Triangle, which sold 14 million copies worldwide and was translated into 22 languages. The supposedly supernatural region would, over the next 15 years, become the subject of hundreds of books and articles, as well as several feature films, TV movies, TV episodes, a TV series, comic books, cartoons, songs, albums, and tabletop and video games. Along with Bigfoot, UFOs, and all manner of “mysteries of the unknown,” the Bermuda Triangle permeated the weird wilderness of 1970s pop culture. While primed by a cult following dating to the mid-1960s that was heavily influenced by the writings of paranormal researcher Charles Fort, the myth can be traced all the way back to Plato’s description of a lost land called Atlantis. Despite being exhaustively debunked shortly after the appearance of Berlitz’s book, it continues to exert a pull on many thousands at a time when three out of four Americans hold at least one paranormal belief. 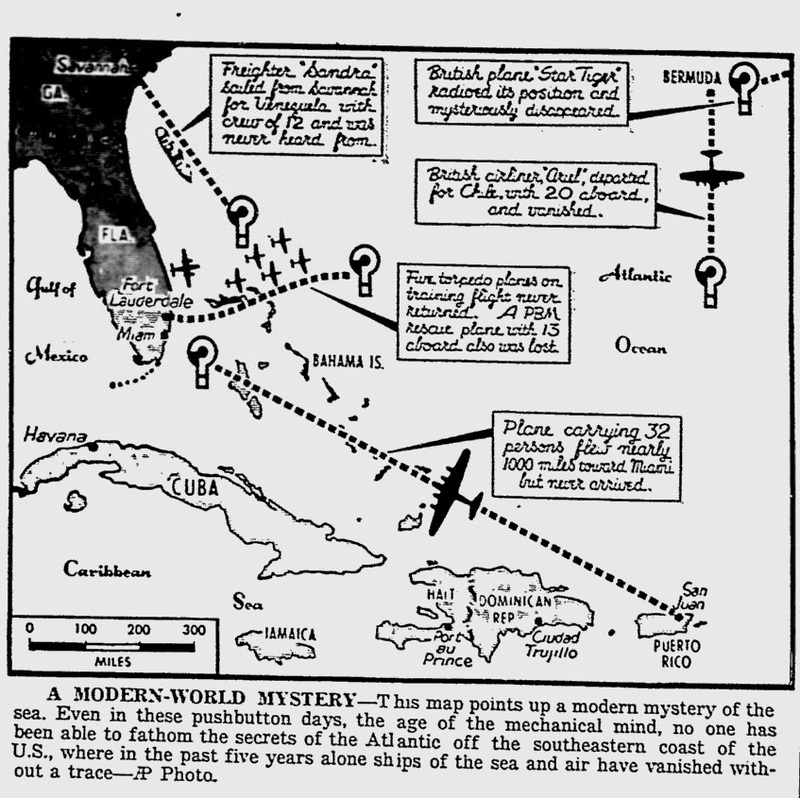 The first known attribution of mysterious disappearances to the region now known as the Bermuda Triangle comes from a nationally syndicated Associated Press article by E.V.W. Jones first published in the Miami Herald and the Miami News on September 17, 1950. Jones does not specifically mention a triangle, although the diagram accompanying the article all but completes one, with the now common vertices named: Miami, Bermuda, and San Juan, Puerto Rico. What Jones does reference is a “limbo of the lost… into which men and their machines and ships can disappear without a trace”—a description not unlike the engraving on Dante’s gate to hell, a “city of woe” and “lost souls,” in the Inferno. The slant of the article is that no matter how powerful our technology in “the age of the mechanical mind,” it cannot penetrate or control the world’s great mysteries, the sea preeminent among them. Jones details incidents that soon became gospel in the literature of the unexplained: the S.S. Sandra “disappeared without a trace” in 1950, despite “[carrying] radio,” an instrument that Jones likens to a modern miracle, a voice that “comes out of the void”; the British aircraft Star Tiger, along with its 25 passengers and 6 crew members, vanished on approach to Bermuda in 1948; and the disappearance of the “five torpedo planes” of Flight 19, upon which so much of the Bermuda Triangle legend hangs, off the coast of Florida on December 5, 1945. Though the disappearances are in no way attributed to supernatural or extraterrestrial forces, Jones makes a distinction between the known world, circumscribed by our modern machines, and the “vast unknown” or “elusive limbo” into which those machines have been “swallowed up,” just as utterly and consistently as in the days sailors feared Scylla and Charybdis. Modern interest in Atlantis began with U.S. Congressman Ignatius Donnelly’s Atlantis: The Antediluvian World (1882) and became a mainstay of the Western occult tradition with the publication of Madame Blavatsky’s The Secret Doctrine (1888), in which the co-founder of the Theosophical Society formulates and describes the seven “root races,” the fourth race originating in Atlantis. Scotsman Lewis Spence, in an effort to rescue Atlantis from esoteric figures like Blavatsky and continue the serious “scientific” study begun by Donnelly, wrote The Problem of Atlantis in 1924 (several volumes on the subject would follow). Here he argues that Atlantis was once a great continent that took up a substantial portion of the ocean it was named after, and that towards the end of the Miocene epoch tremendous volcanic activity caused the continent to break apart into two massive islands, Atlantis and Antillia. The smaller of the two, Antillia, lies directly within what is now called the Bermuda Triangle. in the sunken portions of Atlantis, or Poseidia, under the slime of ages of sea water—near what is known as Bimini, off the coast of Florida. Poseidia will be among the first portion of Atlantis to rise again. Expect it in ’68 or ’69; not so far away! These pronouncements caused some excitement in the 1960s among a cultural milieu that was openly exploring the “Aquarian frontier” and generally sympathetic to psychic and zodiacal prognostications. The first edition of the still-in-print Edgar Cayce on Atlantis, “interpreted” and edited by Cayce’s sons, appeared in 1968, though his readings were in vogue and widely circulated by Cayce’s Association for Research and Enlightenment (A.R.E.) before that. In August 1968, Manson Valentine, a former Yale zoology professor and amateur archaeologist, discovered what he called a “temple” off the coast of North Bimini Island that he hoped “might be part of Atlantis.” Now called the Bimini Road and pegged by geologists as a natural rock formation, Valentine had been a “student of the Bermuda Triangle” since the disappearance of Flight 19 and reportedly engaged in the dive “in hopes of confirming Cayce’s prophecy.” Valentine would later collaborate on several books with Charles Berlitz, including The Bermuda Triangle. The book offers many possible supernatural explanations for disappearances within the Bermuda Triangle, one of them centering on advanced technology (energy crystals called “firestones”) said by Edgar Cayce to be left over from the destruction of Atlantis. In The Bermuda Triangle, Berlitz brings up another entry from Columbus’ journal, this one from September 15th, the day before the “many tufts of grass” were seen floating in the ocean: “In the early part of the night there fell from heaven into the sea a marvelous flame of fire, at a distance of about 4 or 5 leagues from them.” Berlitz’s book was adapted into a documentary of the same name in 1979, produced by Sunn Pictures (In Search of Noah’s Ark, The Mysterious Monsters), the beginning of which shows Columbus and crew agape as dozens of luminous, saucer-shaped objects dash across the sky, the ship’s compass spinning wildly. Some odd ideas are current about the Sargasso Sea because in 1896 [sic] the novelist T.A. Janvier wrote a gripping novel, In the Sargasso Sea, in which he described the tract as an impenetrable tangle of weed holding fast the remains of ships of all ages from Spanish galleons down. … in the heart of the dread Sargasso Sea—the Tideless Sea of the North Atlantic. From the stump of our mizzen mast, one may see, spread out to the far horizon, an interminable waste of weed—a treacherous, silent vastitude of slime and hideousness! 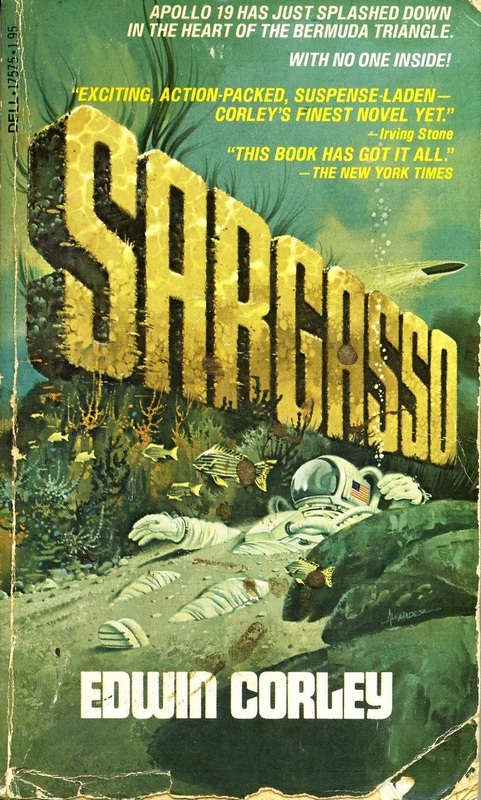 The literary trope headed to the stars as early as 1931, with Edmund Hamilton’s The Sargasso of Space, and was a haven of psychedelic adventure in Hammer Films’ The Lost Continent (1968). Explicit identification of the Sargasso Sea with Atlantis, assuming Himilco’s story was not itself a creative appropriation of Plato’s story, begins with W.H. Babcock’s Legendary Islands of the Atlantic (1922) and Lewis Spence’s Atlantis in America (1925). 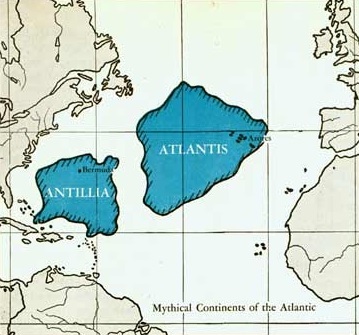 Both authors ascribe Plato’s description of “unnavigable” waters over sunken Atlantis to the “dead waters of the Sargasso Sea.” The 2,000,000 square mile ellipsoid spans the entire area of Spence’s island of Antillia, as well as the southern portion of his Atlantis. As there were those individuals that attempted to bring again to the mind of man more of those forces that are manifest by the closer association of the mental and spiritual, or the soul forces that were more and more as individual and personal forms in the world, the use of the these elements – as for the building up, or the passage of individuals through space – brought the uses of the gases then (in the existent forces), and the individuals being able to become the elements, and elementals themselves, added to that used in the form of what is at present known as the raising of the powers from the sun itself, to the ray that makes for disintegration of the atom, in the gaseous forces formed, and brought about the destruction in that portion of the land now presented, or represented, or called, Sargasso Sea. Charles Fort (1874-1932), an originator of the field of anomalous investigation (his biographers have called him the “prophet of the unexplained” and “the man who invented the supernatural“), postulates the existence of a “Super-Sargasso Sea” starting with his first book, The Book of the Damned (1919). Part reportage (“a procession of data that science has excluded”), part satire, and part nonsense literature, the text is an attack against what he saw as the arrogance of the “exclusionary” scientific worldview—he once referred to scientists as “pale ignorances, presiding over microscopes.” Thanks to the publishing genius of Donald Wollheim, Ace Books released new editions of all four of Charles Fort’s books throughout the 1960s, starting with The Book of the Damned in 1962. Ace, though specializing in science fiction, had been releasing titles in the booming “strange but true” genre since the late 1950s. He concludes, as far as any thought can be concluded in a book devoted to undermining the basis of all conclusion (an irony of which Fort is all too aware), that the Super-Sargasso Sea “functions very well as a nucleus around which to gather data that oppose Exclusionism,” though “something else… may overthrow it later.” Fort was no doubt familiar with William James, the American philosopher and psychologist who was also a founding member of the American Society for Psychical Research. James developed the philosophical school of pragmatism, whereby the definition of the “true” was “what works” in the mind of the believer, and much of his writing is a spirited defense of the validity of personal, private experience (including mystical experience) and the “feelings of human beings” over (but not irrespective of) the “esteem for facts” vaunted by scientific materialism. Mentions of strange happenings within the Northwest Atlantic “triangle” area start to appear in the press soon after publication of Vincent Gaddis’ Invisible Horizons: True Mysteries of the Sea in 1965. The book, rushed into paperback by Ace (naturally), includes a chapter called “The Triangle of Death” expanded from his 1964 article for Argosy, “The Deadly Bermuda Triangle”—the first recorded use of the moniker. Gaddis, a journalist by trade before he went freelance, was a member of the Fortean Society and wrote for the Society’s magazine, Doubt, starting in the 1940s. He was also a contributing editor for the San Diego-based The Round Robin (1945-1959), “a bulletin of contact and information for students of psychic research and parapsychology” edited by N. Meade Layne, a former English professor whose theory of a parallel dimension called Etheria influenced Gaddis as well as the ufology field. There is a triangular region in England, three points of which appear so often in our data that the region should be specially known to us, and I know it myself as the London Triangle. It is pointed in the north by Worcester and Hereford, in the south by Reading, Berkshire, and in the east by Colchester, Essex. The line between Colchester and Reading runs through London. In 1972, Larry Kusche, then a librarian at Arizona State University, started accumulating source material on the Bermuda Triangle due to the “overwhelming demand” of his patrons. 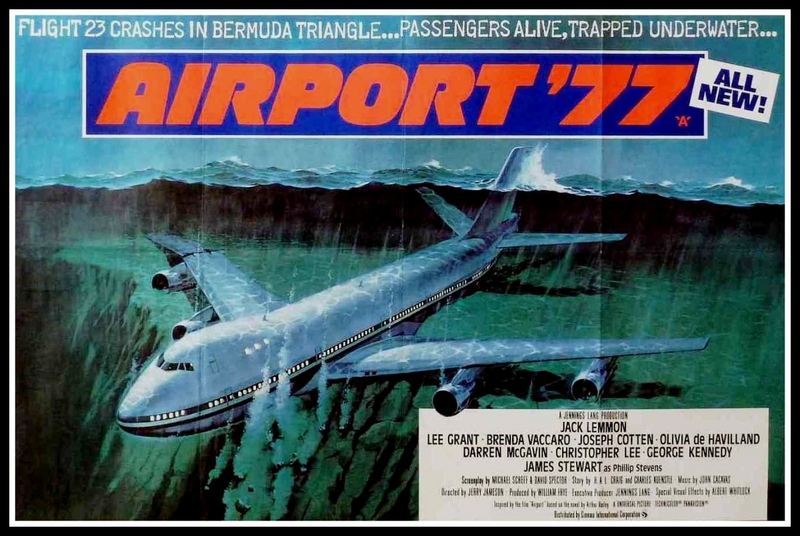 The end result was 1975’s The Bermuda Triangle Mystery – Solved, to this day the definitive refutation of “a manufactured mystery” whose narrative was “repeated so many times that it began to take on the aura of truth.” Kusche researched and documented the Navy’s 400-page report on “The Loss of Flight 19”—a report Eckert had said did not exist—and found none of the dialogue Eckert recorded and his followers regurgitated. There was nothing at all mysterious about the incident, Kusche concluded: only a perfect storm of pilot error and bad luck. Could some of these crews have been kidnapped by extra-terrestrials? To those who have investigated this question, the evidence that there is interplanetary or interstellar traffic is impressive. We may be ignored for the same reason that savages on a jungle-clad isle are ignored by passing merchant vessels… Still, occasional visitors from the void may pick up some of us for exhibition in their zoos! Gaddis was the bridge between E.V.W. Jones and Charles Berlitz. 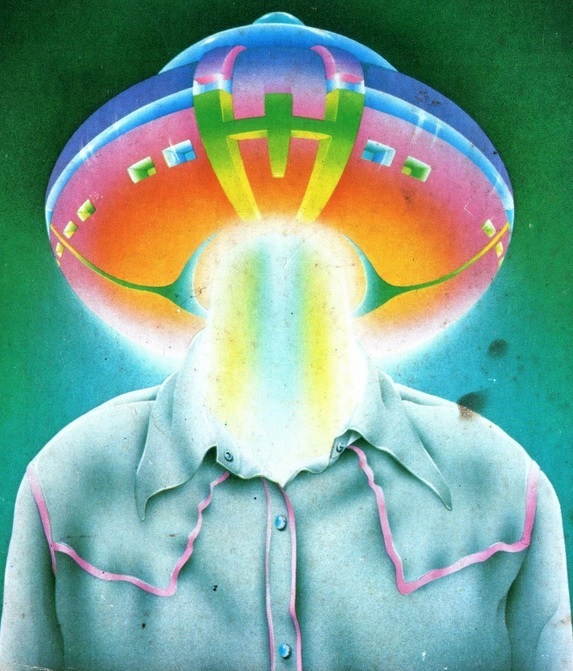 He popularized not only the Bermuda Triangle but a foundational trope in ufology that went mainstream with Steven Spielberg’s Close Encounters of the Third Kind (1977), the conclusion of which shows the crew of Flight 19—their bombers discovered intact and operational in the Sonoran Desert at the beginning of the film—and other alleged abductees being released from the alien mothership. The tremendous advancements in science and technology over the last 70 years have done nothing to curb belief in the paranormal. If anything, the opposite has happened. In 1957 only 25% of Americans believed UFOs were extraterrestrial in nature, compared to nearly 50% today, and a National Geographic poll from 2012 found that 77% of Americans “think that aliens have visited earth.” Meanwhile, 39% of adults in the U.K. believe in ghosts, compared to only 10% in 1950—numbers nearly identical in the U.S. In that same span, church attendance on both sides of the Atlantic has declined significantly, as has membership in, trust in, and relevance of organized religion. Still, as Kusche says at the end of his book: “We all seem to have an innate desire to remain in awe of those phenomena for which there appears to be no logical, scientific explanation.” At no time was that statement truer than in the 1970s, a decade marked by grim, all too terrestrial austerity on the one hand, and a population highly receptive (thanks to the previous decade) to free-form occult metaphysics on the other. It’s simply much more exhilarating and meaningful, and so much less tragic, to imagine the baby-faced crew of Flight 19 abducted by a Vegan starship, or thrown into “a fifth dimension beyond that which is known to man,” instead of running out of gas and ditching into stormy seas on what was supposed to be a routine training mission. K.E. Roberts is Editor-in-Chief of We Are the Mutants and a freelance writer. He lives in Los Angeles with his wife, two daughters, and the longest cat any of them have ever seen. A large number of writers misinterpreted what Edgar Cayce said in his readings and then blamed him for being wrong. He would use terms like 58, 68 or 98 when talking about Atlantis rising. Global warming and the resulting crustal displacement caused by rising sea levels make 2058 to 2098 a time when parts of Atlantis could rise while coast lines of many continents sink. The two ley lines of Mayan temples in the Yucatan we used to triangulate the underwater city off the coast of South West Cuba supports the idea that Mayan culture and even Olmec culture are much older than previously thought. The Mayan/Olmec temples on the Yucatan ley lines would have to have been constructed before the Atlantian city had sank under water. I remember seeing a special on the Bermuda Triangle when I was a kid. It was freaking me out, but then my Dad told me I had already flown over it a number of times. We lived in the Virgin Islands, so pretty much every time I visited the States we went over it.